com.apple.hiservices-xpcservice hangs repeatedly ever since I upgraded to macOS Mojave 10.14.1. Now,everytime the process hangs it is indicated by red colored fonts in the Activity Monitor. Due to the frequent hangs my system slows down and it's barely usable due to extremely slow performance. I have already Googled it (The Process) and also contacted Apple regarding the usage of this process and the reason behind it's frequent hick-ups. Alas! they couldn't help much. So, I terminated the process. As soon as I terminated the process (com.apple.hiservices-xpcservice) my mac started running fast once again. But, whenever I restart the system or leave the mac idle for a few minutes and then if I start using it once again! 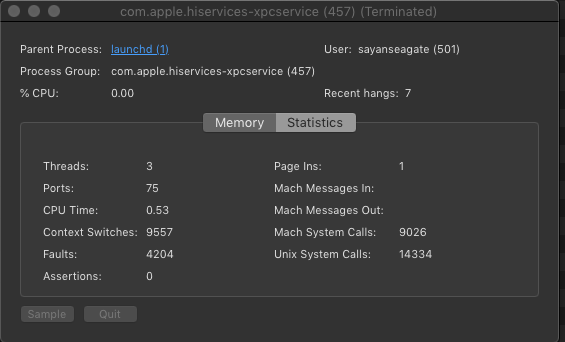 out of no where, the process (com.apple.hiservices-xpcservice), shows up once again in the activity monitor resulting in slow performance issues along with hangs and freezes across macOS. 3.5GHz quad-core Intel Core i5 processor (Turbo Boost up to 3.9GHz) Configurable to 4.0GHz quad-core Intel Core i7 (Turbo Boost up to 4.4GHz). 8GB (two 4GB) of 1600MHz DDR3 memory; four SO-DIMM slots, user accessible Configurable to 16GB or 32GB. Tried to disable SIP, then remove execution rights on com.apple.hiservices-xpcservice, reboot after re-enabling SIP. Result : Safari keeps crashing, each time it opens so it seems to be linked to apple apps. Giving back execution rights on the service repaired Safari .. I didn't try to disable this com.apple.hiservices, I just skipped from my computer. Problem solved. It didn't come back. However, there are some minor differences in some sites, nothing to be worried about. Not the answer you're looking for? Browse other questions tagged macos terminal performance hang activity-monitor . How to run a performance benchmark on my MacBook Pro?